I have read many books about teenage pregnancy over the years, and all of them appear to follow some sort of formula, whether they are based on a true story or not. Rarely do these plotlines alter, especially after the initial path has been set by the author. The start of the book is usually the unprotected, untimely conception of the child, and the ending is usually at or just after the birth. The teenagers involved deal with all kinds of emotions, as well as the reactions of their peers, family and society, but most come out of the events stronger and more mature as a result. This book is the exception. 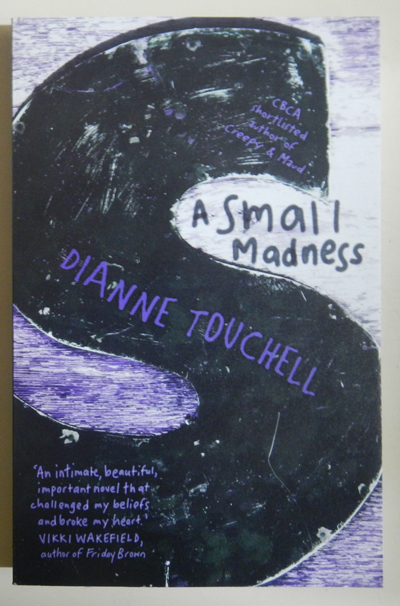 I have never before read a teenage pregnancy book with a path like the one Dianne Touchell has set in her novel A Small Madness. This is a darkly haunting study of how mental illness can alter perceptions and change how a person sees their circumstances. What is perhaps most disturbing is that this novel starts out in relatively the same way as most books of the genre, twisting as the story progresses, and ultimately ending with a completely foreign result. Rose and Michael are in their final year of high school. They are both relatively high achievers, with Rose a star on the stage and Michael a keen participant in extra-curricular activities. They both attend church services with their parents and are active within that community. Living within a five minute walk of one another, and with so many similarities, it is only natural that they form a relationship together, and thus, start themselves on a terrible downward spiral. After their first sexual experience together (which vaguely reminded me of a Puberty Blues-style encounter on the beach), Michael shows some concern about not having used protection, but Rose is blasé about the fact, wondering instead if people can tell she is now a real woman after becoming sexually active. Several months later, Rose realises that she hasn’t yet had her period, and enlists the help of her best friend (and school ‘bike’) Liv to find the cause. A positive pregnancy test confirms Rose’s worst fears, and earns her the disapproval of Liv (despite her own tarnished reputation). But Liv promises to stand by Rose and whatever decision she decides to make regarding the baby. This novel does not have a happy ending. It doesn’t even have a resolved ending- only one where denial and love are dependent on each other and the actions of two teenagers in love are cast in a bittersweet light. Despite the teen pregnancy theme of the novel, this is not really the crux of the story- instead, the focus is on the skewed mental stability of the protagonist and the coping strategies used by her and those around her. Haunting and though-provoking, I guarantee you will still be thinking about this book long after you read the final pages.